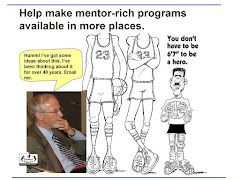 Tutor Mentor Institute, LLC: "So You're Trying to Duplicate What Kids Have in Affluent Areas!" "So You're Trying to Duplicate What Kids Have in Affluent Areas!" 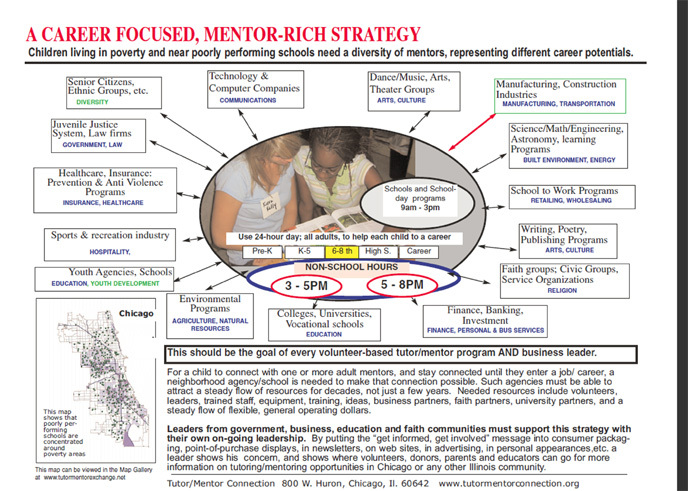 I led a non-school tutor/mentor program in Chicago from 1975-2011, serving inner-city youth from the Cabrini-Green area. 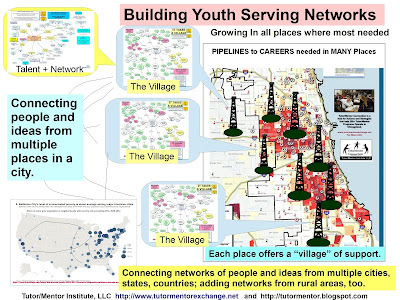 This is the graphic one of my volunteers was looking at in the 1990s when he turned to me and said, "So You're Trying to Duplicate What Kids Have in Affluent Areas!" Yes. That's what I feel a mentor-rich, non-school, tutor, mentor and learning program can try to do. I've written about this many times in the past, but was prompted to write again today after reading an article titled, "I look like a self-made millionaire, but I owe my success to privilege." Since 2015 I've posted articles about a book written by Dr. Robert Putnam, titled "Our Kids: The American Dream in Crisis", where he shows that affluent youth have growing advantages that are not available to low income youth of any race. 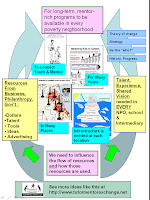 I created this concept map to illustrate this. 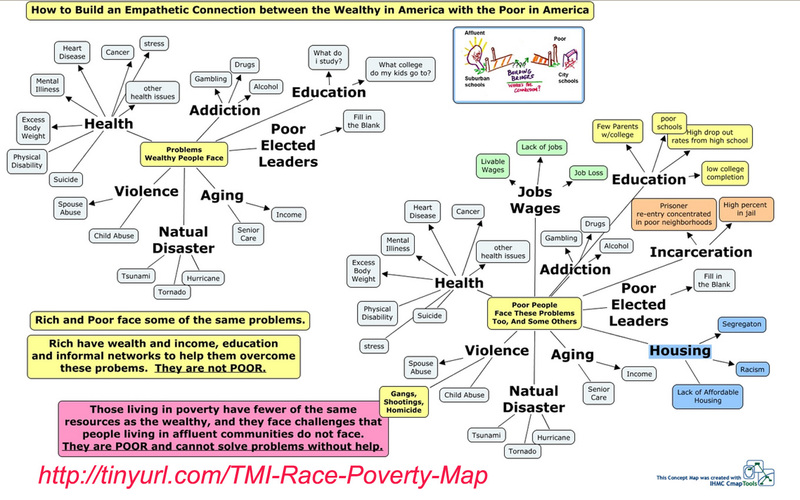 If you're an African American living in poverty, you have even more challenges to overcome. In the graphic at the top of the page I show a small map of Chicago in the lower left corner. This is to emphasize the need for well-organized, long-term, tutor/mentor programs to in all high poverty areas, serving a growing number of youth from first grade through high school and beyond. That's the type of support affluent families and communities offer their kids. Since families in high poverty areas struggle just to put food on the table and pay rent, and deal with outside influences such as violence, crime, racial discrimination, etc., it's up to people who don't live in poverty to help make needed programs available, and keep them available for many years. So where are leaders talking about this? What are the challenges? What are the Tipping Points? I've spent over 30 years thinking about this. Below is one of many presentations that share my ideas. If we want well-organized, on-going, non-school tutor/mentor and learning programs to reach youth in high poverty areas of big cities, rural areas and reservations, we need to be building libraries of information, which I have been doing, and then using that information to train leaders who will staff these programs and who will support decision making among businesses, foundations and government policy makers. I created this graphic a couple of years ago. If we want kids in poverty to move through school more safely and into jobs and lives free of poverty, we need to influence what non profit leaders and staff do, and we need to influence what business, foundations, government, etc. do. Read the article. I've spent 40 years thinking of ways to recruit adult volunteers to be tutors, mentors and change agents in the lives of urban youth. I've been writing articles and sharing them via printed newsletters and Internet for 23 years. I don't expect anyone to instantly grasp what I'm describing. It's only by spending time reading, reflecting, and creating your own visualizations, over and over for many years, that others will build a shared understanding. That means the learning needs to begin while future leaders are still in middle school! I keep searching for partners, benefactors, universities, etc. 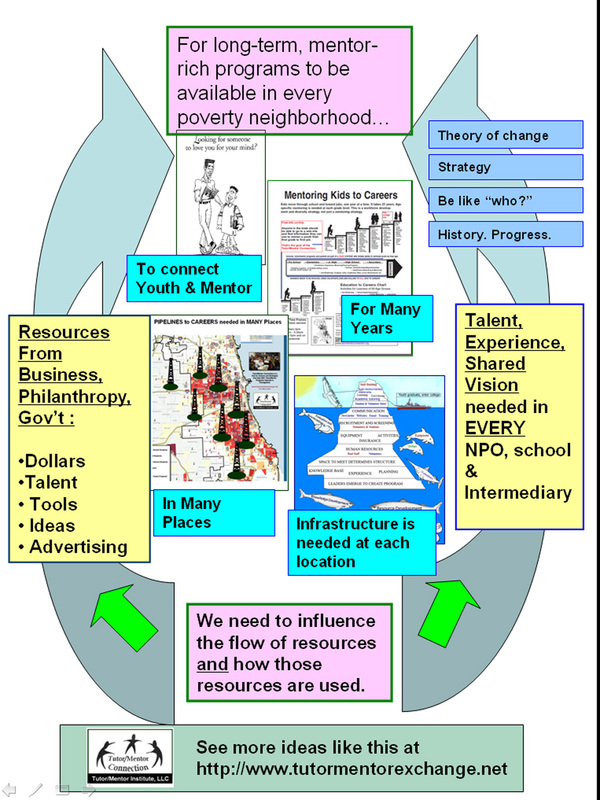 who understand the long-term work that needs to be done in order for well-organized, long-term programs be be reaching more youth in high poverty with support systems that give these youth some of the same "privileges" as affluent White kids grow up with. If you want to help please reach out to me.